There's one more point I want to make. I think many remember cheap Japanese integrated amps from the 70s and 80s and tend to lump contemporary Japanese gear in with how these units used to sound. Which in many cases just wasn't great in any way, shape or form. At least level, at least, nothing could be further than the truth these days. Spot on. Its way too easy to fall into that way of thinking, because few have had a chance to hear such equipment. 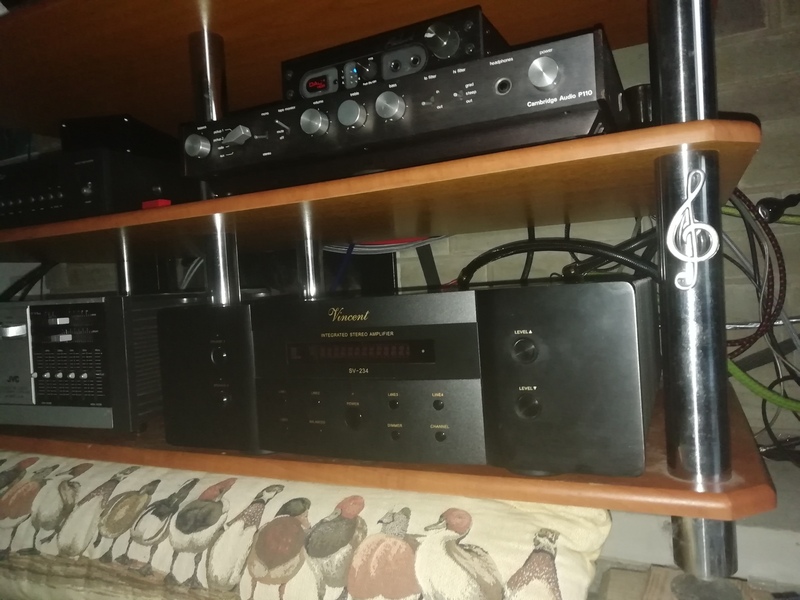 I had a whiff or two at Munich, rationalising why the Luxman rooms have sounded very good with really relatively modest speakers for the show but expensive (for Luxman but cheap for the show) amps. It became pretty obvious the amps were a cut above. It gave me the confidence to take a punt on the amp. The Vincent SV-234 is my main amp now. Very impressed so far. Power with grace and subtlety. I've had a biggish Vincent amp on my Want List for years. It's finally here. And, unlike Justin's new baby, I can actually lift it! And also a re-furbed Cambridge Audio P110, a Stan Curtis design from the early days. I bought it as a bit of fun to stand-in during the period between main amps. It sounds remarkably clean, transparent and detailed when the tape input is used - that bypasses the preamp section and really clarifies and opens things up. But no, it doesn't have the sheer whump of Vinnie or match its tonal richness. I suspect the new components are still bedding in, I shall leave it "cooking" with a spare output from the Benchmark DAC and I shall return to it now and then. A useful spare to have around. I have a P50 with matching T55 tuner in my collection. The tuner is very good. However both are now only kept as examples of stylish British audio designs of the early '70s. And I have a P80. It too sounds very good. The P110 is very much more than that and imho can easily hold its own against present day amps. Bypass the pre section and it's a genuinely class act. I do agree that it looks seriously cool, though! Yeah where to put my new amp is a bit of a problem given I want to keep it. You need to take over the upstairs living room. And those Aps will look stunning at each side of that big picture window. It'll be a nice surprise for Gillie when she gets home from work. Turned Vinnie on this morning (wonderful to have a front mounted power switch!! ), sounded cold and clinical and a bit grainy. .
Over the next 10 minutes I heard it gradually warm up and get into its stride. I've never heard such an obvious warm-up period before.